— This article by Jerry Cates and Sarah dLR, first published on 28 August 2011, was last revised on 23 October 2013. © Bugsinthenews Vol. 12:08(04). Could you tell me what type of snake this is? I found it in my yard. To protect Sarah’s privacy, her surname has been abbreviated in the caption of the photo and in the title to this web page. Note that the photos on this page, as with the photos on all the web pages of BugsInTheNews, may be enlarged for more detailed viewing by hovering your cursor over the photo and clicking. It has been a while since anyone has sent me a photo of a buttermilk racer. The most recent ones that have come in are posted below, as part of this posting. Almost all the photos of this snake species that I’ve been received during the past fifteen years have come from around Conroe, or nearby, at The Woodlands. Sarah did not mention immediately where her home was located, but — when asked — disclosed that she lived in Tomball, Texas. That’s about ten miles west of The Woodlands, and 25 miles southwest of Conroe. Buttermilk racers are members of the Colubridae family of snakes. That, alone, does not tell us much about them, except that they are not vipers (of the Viperidae family, which contains the rattlesnakes, copperheads, and cottonmouths) or elapids (of the Elapidae family, which in North America is represented by the coral snakes, and in Texas only one — the Texas coral snake — is present). 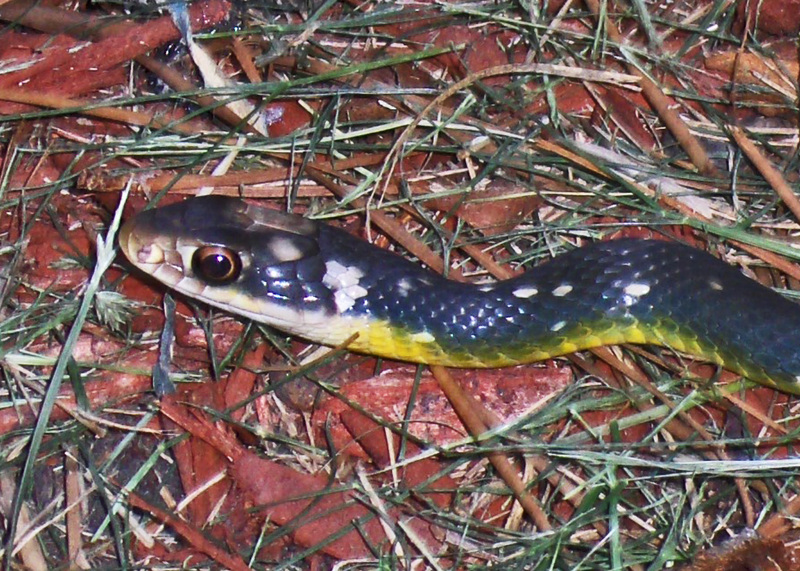 What being a colubrid does tell us, however, is that this is not a venomous snake. Colubrids in other parts of the world are sometimes venomous, but none of our North American colubrid species are dangerously so, even if some, like our ring-necked snakes, garter snakes, and hog-nosed snakes, have mildly toxic saliva that, under unusual circumstances, can produce a slight swelling and reddening of the wound site if a bite occurs. The buttermilk racer was first described in 1862 by the American scientist Edward Drinker Cope. Mr. Cope, however, gave it the taxonomical name of Bascanium anthicus. The generic name Bascanium has been applied historically to a number of constricting black snakes, though for reasons that are somewhat obscure. The Greeks have a word, βασκανος (pron. “bascanos”) that denotes a bewitcher or sorcerer. Inasmuch as these snakes often present as darkly black snakes, usually with a few and sometimes with many randomly spaced white or yellowish flecks, perhaps the general conception of snakes as denizens of the mysterious underworld (which, in terms of their propensity to spend the winter in underground hibernacula, is apropos), led to the application of this name to a number of black snakes in general. In any case, Cope’s specific name — anthicus — has been retained to distinguish the buttermilk racer subspecies His generic and species names were dropped in favor of today’s Coluber constrictor, which now designate most if not all those North American serpents known as racers. The word anthicus is derived from the Greek ανθικος (“anthikos”), which means “flowering.” This seems to be a reference to the beautiful impression one gets from viewing this snake as it reposes in the garden, itself seeming to bloom amongst the botanicals. If that seems to you a stretch, well, perhaps you’d have to see one in your garden to appreciate the imagery. Of course in the event that you — in company with most of your fellow human beings — are disinclined to view any snake as a thing of beauty, even that won’t work. Sarah’s specimen is slightly unusual in that the belly, beginning just beyond the creamy-white underchin, is colored a bright yellow. Normally the buttermilk racer has a white or pale belly with a few pale yellow spots (Werler & Dixon, 2000, p. 74), not the uniform yellow seen here. 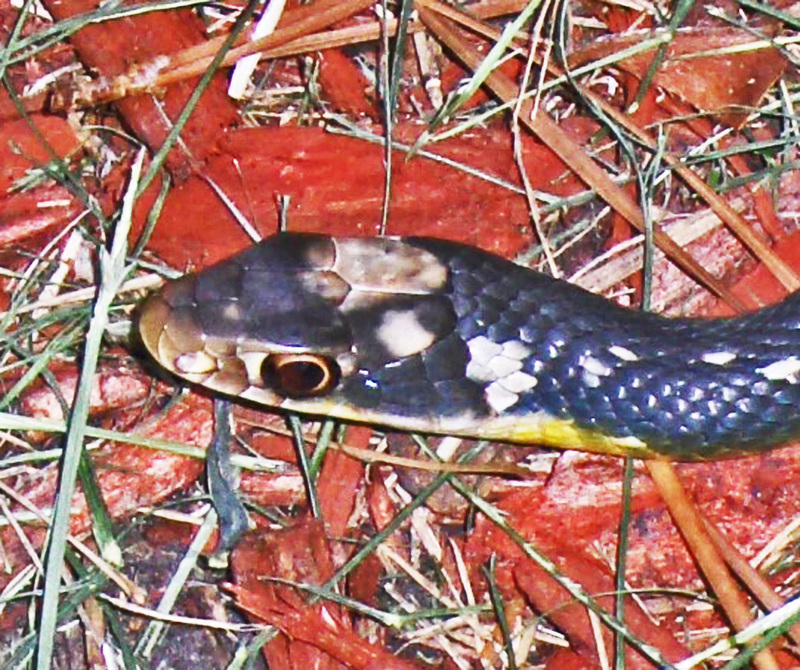 However, since this subspecies overlaps in range with the eastern yellow-bellied racer (Coluber constrictor flaviventris), and — from all indications — all our racers mate at about the same time, i.e., April and May, soon after leaving their hibernacula in the springtime, hybridization is always possible. The buttermilk racer, along with all the other racers in North America, is a nervous, quick moving snake that is quite averse to being handled. Normally these snakes flee at the slightest provocation, though Sarah reports that this particular snake did not move at all, except for flicking its tongue from time to time, when she approached it. Only when she used a stick to move its tail did it take off, and then it moved with the typical speed of the racer, quick and lightning fast. At midbody the scales of this species do not exceed 17 scale rows, but may be less. The tan racer and eastern yellow-bellied racers, on the other hand, tend to have precisely 17 midbody scale rows, at least according to Werler & Dixon. My experiences suggest that precise numbers of midbody scale rows are often not absolute, so don’t be surprised to find a specimen that falls outside these numbers. Sarah’s snake appears to be representative of its species in this regard. The snake had gotten hung up in the netting Monte had put around his backyard garden to keep the birds from stealing his fresh vegetables. Unfortunately, the netting does nothing to keep mice, lizards, small snakes (like this one) and other animals out of the garden, so when this buttermilk racer happened by (probably chasing a lizard or mouse) it could get in, catch its prey and swallow it, and then… and then… and then… well, now it had a bulge in its tummy that kept it from getting out. My quick note back to Monte informed him the snake was harmless, but he never replied and thus it was not possible to learn where the photo was taken. His e-mail address suggested he was in East Texas, and almost all the photos sent to me of this species come from Conroe somewhere or nearby. 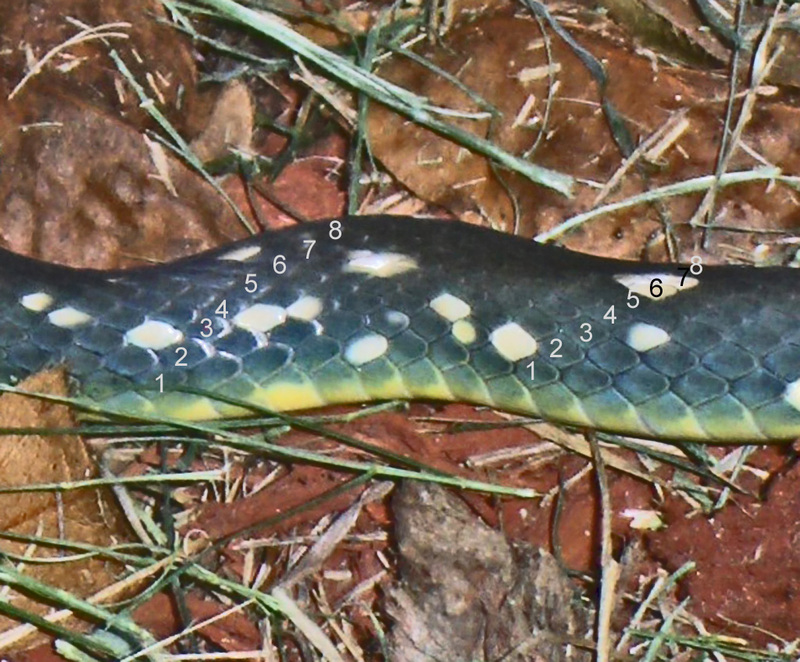 Serpentes: North American Snake Markings & Coloration Guide. Serpentes: Snake Anatomy, Physiology, and Taxonomy. 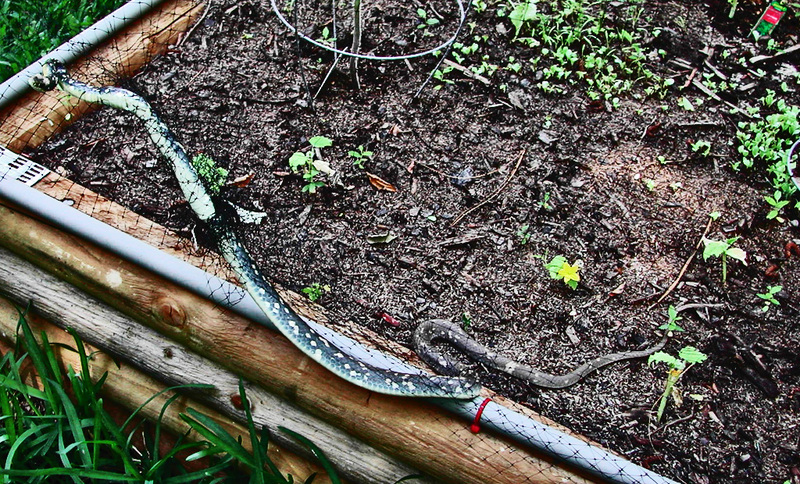 Serpentes: Snake Exclusion — How to Snake-proof your Yard and Home. Serpentes: Snake Repellents — How, and How Well, do They Work? Serpentes: Snakes, Rodents, & Droughts. Serpentes: What is Meant by “A Reasonably Snake-Free Environment”? Serpentes: Viperidae: Crotalinae: Western Diamond-backed Rattlesnake (Crotalus atrox, Baird & Girard, 1853), Cedar Creek, TX — 22 Oct 2010. Arikan, Hüseyin et al. 2008. Electrophoretic characterisation of the venom samples obtained from various Anatolian snakes(Serpentes: Colubridae, Viperidae, Elapidae). N.W. J. Zool. Vol. 4, No. 1, pp.16-28. Brodie, E. D. III, and F. J. Janzen. Experimental Studies of Snake Mimicry; Generalized Avoidance of Ringed Snakes Patterns by Free-ranging Avian Predators. Functional Ecology Vol. 9, No. 2 (186-190). Chippaux, J. P., et al. 1991. Snake Venom Variability: Methods of study, results, and Interpretation. Toxicon Vol. 29, No. I I , pp. 1279-1303. Coborn, John. 1995.Boas & Pythons and Other Friendly Snakes. T. F. H. Publications Inc.
Conant, Roger, and Joseph T. Collins, 1998. Reptiles and Amphibians — Eastern/Central North America, Third Ed. Peterson Field Guides. Houghton Mifflin Co.
Cundall, David. 2009. Viper Fangs: Functional Limitations of Extreme Teeth. Physiological and Biochemical Zoology 82(1):63–79. Deufel, Alexandra, and David Cundall. 2004.Functional plasticity of the venom delivery system in snakes with a focus on the poststrike prey release behavior. Zoologischer Anzeiger 245 (2006) 249–267. Eckerman, Curtis M. 1997. Allopatric Mimicry. Unpublished Graduate Research Report prepared for the journal Evolutionary Ecology. Grachevca, Elena, et al., 2010. Molecular Basis for Infrared Detection by Snakes. Nature, 15 April 2010. Greene, Harry W., 1997. Snakes: the Evolution of Mystery in Nature. University of California Press. Greene, Harry W., and Roy W. McDiarmid. 2005. Wallace and Savage: Heroes, Theories, and Venomous Snake Mimicry. Ch. 9 of Ecology and evolution in the tropics: a herpetological perspective. Univ. Chicago Press. Johnson, Tom R. 2000. Missouri Copperheads. Missouri Conservation Commission. Klauber, Lawrence M. 1982. Rattlesnakes: their Habits, Life Histories & Influence on Mankind. Univ. Calif. Press. Rodrıguez-Robles, Javier A., and Jose´ M. De Jesus-Escobar. 2000. Molecular Systematics of NewWorld Gopher, Bull, and Pinesnakes(Pituophis: Colubridae), a Transcontinental Species Complex. Molecular Phylogenetics and Evolution, Vol. 14, No. 1, January, pp. 35–50. Schulz, Klaus-Dieter, 1996. 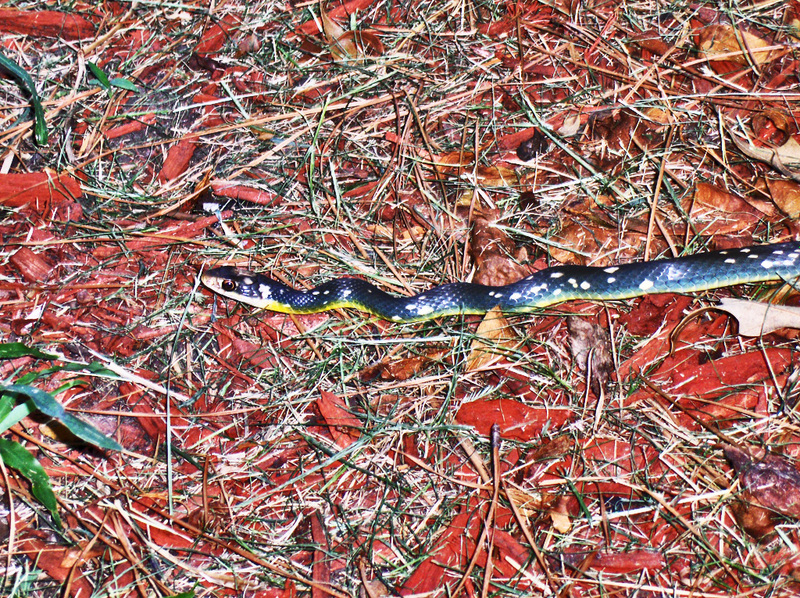 A Monograph of the Colubrid Snakes of the Genus Elaphe Fitzinger. Koeltz Scientific Books. Tennant, Alan,1998. A Field Guide to Texas Snakes, Second Ed. Gulf Publishing. Weinstein, Scott A., et al. 1994.Reptile Venom Glands — Form, Function, and Future. Handbook of Venoms and Toxins of Reptiles. CRC Press. Werler, John E., and James R. Dixon, 2000. Texas Snakes. University of Texas Press. World Health Organization. 2002. Management of Snakebite and Research. WHO SEA-RES-2. Wozniak, Edward J., John Wisser, and Michael Schwartz. 2006. Venomous Adversaries: A Reference to Snake Identification, Field Safety, and Bite-Victim First Aid for Disaster-Response Personnel Deploying Into the Hurricane-Prone Regions of North America. Wilderness and Environmental Medicine, 17, 246-266. — Questions? Corrections? Comments? BUG ME RIGHT NOW! Telephone Jerry directly at 512-331-1111, or e-mail jerry.cates@bugsinthenews.info. You may also register, log in, and leave a detailed comment in the space provided below.